John Sungkamee, the owner, hailed that this curry is his family’s 30 year old recipe and I really like the balance of savory and creaminess here. I suspect creaminess came from the inclusion of coconut milk while the jicama, basil & bell pepper brought up a distinct natural sweetness. I also liked the homemade fish balls, very crunchy and didn’t feel gelatinous while chewing. My two-cents here is that I wish the dish packed a little more heat. To be honest, I don’t normally go gaga when I had a really good Thai food but after sinking my teeth into this dish, I wished I could keep eating this. This dish is a melting pot of shrimp, crab meat, and scallop baked with chili, coconut and Thai basil. It’s a blissful symphony – just the perfect balance of sweet, sour, salty, and hot. 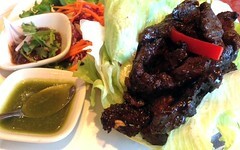 I mean, this is what Thai food is supposed to be – bold flavors with distinct tastes and textures. Hands down the best dish of the night! 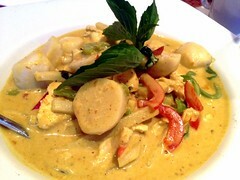 This is another Southern Thai dish I never had in my life. 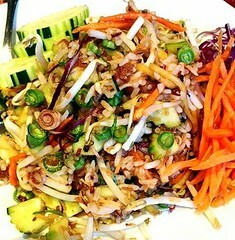 Khao Yam is basically a Thai Rice Salad. It’s an amalgamation of fragrant rice with grated coconut, dry shrimp, micro-sliced kaffir lime leaves, lemongrass, pennywort and turmeric leaves. 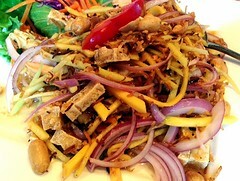 Then all these ingredients are mixed together with a sweet fish sauce. While I appreciate the craft and the brazen approach, gotta admit, this was my least favorite dish. 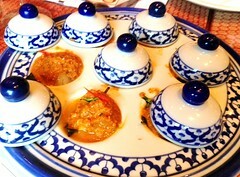 Thought the sweetness of the fish sauce overwhelmed all the herbs, spices and accents presented in this dish. I wished there’s a perfect counterpoint to the sweetness but I couldn’t find it here. So here’s the omnipresent Thai street food. You’ve probably encountered it in your life more than once. 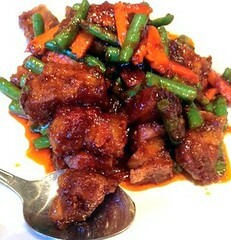 If you’re not familiar, Pad Prik King is string beans and crispy pork stir fried in red curry sauce. I loved the texture of the pork. When you bite into it, the skin has salty bits of crackling while the flesh oozed out red curry. Party in your mouth! It’s hard to only eat a few; I had to get two or three spoonfuls. Eat this dish with rice and you’ll have yourself a hearty comfort food. No matter how full I am, there’s always room for Khao Niao Mamuang. This is probably the best Khao Niao Mamuang I’ve ever had. The sticky rice was sweet and creamy (from coconut milk), thought I was eating a pudding. 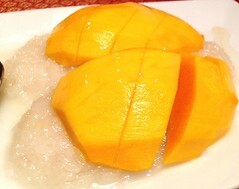 Love the natural sweetness and hint of tang on the ripe mangoes. Second serving, please! Overall, I think my experience at Emporium is quite delightful. Emporium has been established for a long time, and I’m glad to see John Sungkamee’s daring approach and constant dedication to excellence. Even if you decided to order Pad Thai or Pork Satay, you can rest assured the dish will be carefully executed and it will taste different (in a good way) from the typical Thai fare. I can’t wait to come back and I will request my dishes very spicy.